Product #15575 | SKU MTP 840 | 0.0 (no ratings yet) Thanks for your rating! 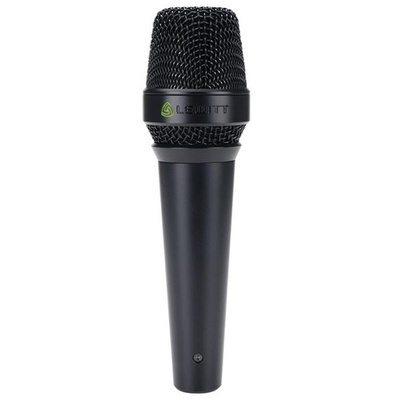 With the dynamic performance microphone MTP 840 DM, LEWITT puts true studio performance onstage. Universally usable thanks to switchable sensitivity and a multi-step high-pass filter, infinitely durable and optimally equipped for punishing touring conditions without compromising on sound - this is what the MTP 840 DM stands for. Excellent transient response, refined electronics and superior capsule design make the MTP 840 DM a unique tool for onstage use. Innovative circuitry design and the highest-quality components make for exceptionally low self-noise and a maximum of dynamic range when in active mode; the frequency curve, which is specially tailored for vocal recordings, provides the ultimate in sound quality. Numerous useful features make the MTP 840 DM incomparably versatile onstage and in the studio. A three-step high-pass filter directly influences the proximity effect, allowing adaptation of the mic to an individual artist’s requirements. The built-in three-position switchable amplifier, is specially adapted to the MTP 840’s components, allowing lossless recording of even far-off sources. The LEDs on the MTP 840 DM, which can be turned off, make checking the mic’s numerous settings a direct and easy matter even in the dark. The new dynamic flagship MTP 840 DM transports the artist’s voice in a natural and powerful way, lending his or her voice the necessary presence without falsifying its individual character. Consistent directionality across the entire frequency spectrum makes for maximum protection against feedback, with the flexibly suspended capsule reducing structure-borne noise to a minimum.